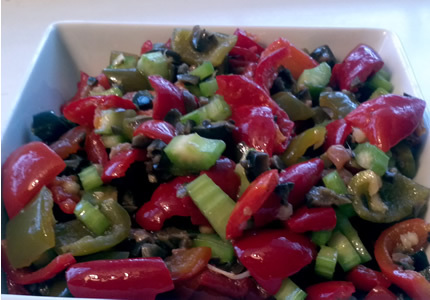 Authentic Italian Hot Pepper Salad recipe sent down through generations in the family. If you can handle the heat, this stuff is absolutely delicious. Very versatile…I ate it on a fresh roll for a mouthwatering sandwich. Keep the salad on the counter for the first 8 hours, stirring every hour. Store in fridge for 48 hours before serving.